It has been 228 years since George Washington delivered the first presidential "annual address," now known as the State of the Union, that covered pressing topics — military spending, the economy, education, foreign affairs, and immigration. 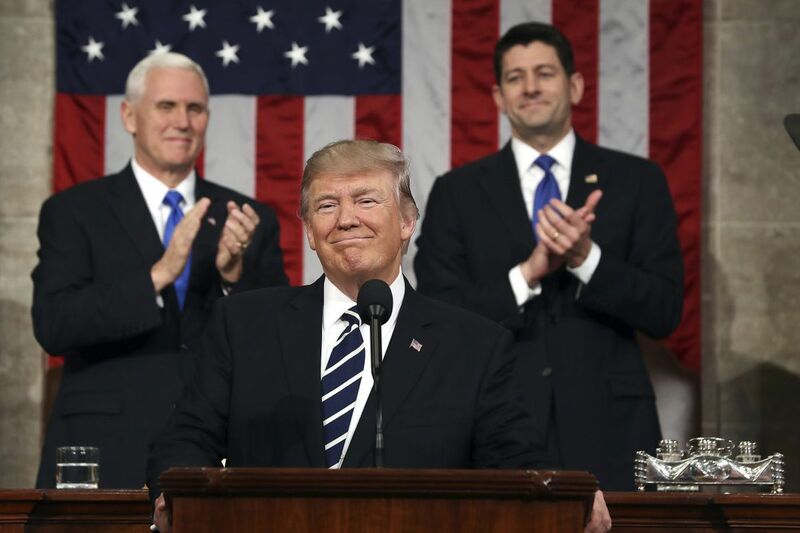 The centuries have rolled by, but the topics will likely be the same when President Trump delivers his first State of the Union address Tuesday. Washington's speech set a precedent in January 1790, not just in its brevity, lasting as it did for 10 minutes, but by projecting an aspirational view to Congress of how separate but equal parts of the government could work together. We now know that Trump can stand at a lectern and read a speech from a teleprompter, setting aside freestyle populist bombast to make scripted and salient points. We saw him do it last Feb. 28, in his first address to a joint session of the House and Senate. His address seemed, even some of Trump's critics admitted, "presidential." But Trump has spent more than a year following up sensible oratory with specious outbursts on Twitter. That's what he did in February. The Associated Press described that speech as "a rousing call for unity." A few days later, the president went on a Twitter tirade about his predecessor, President Barack Obama, having allegedly wiretapped Trump Tower during the 2016 campaign season. At this point, all we can hope for is a presidential message that lasts longer than a quart of milk. Does every high-minded address need to curdle into irrational recrimination? Tuesday's address to Congress is a set piece in our democracy, a presidential job requirement set out in Article II, Section 3, of the Constitution. These addresses have seen an uptick in partisan fervency since the 1990s — booing and groaning and one outburst of "You lie!" from a member of the House in 2009. At the end of his first year in office, Trump set a historically low mark for popularity as measured against past presidencies. We urge both parties to set that aside Tuesday. Republicans should not rush to defend every word Trump utters, just as Democrats should not attack every notion they hear in their opposition response. They should listen, consider what Trump has to say, and then hold him to it every day until the calendar rolls around to his next State of the Union address. There is a staggering list of complicated issues that must be resolved; both sides should focus on what can be accomplished. "The welfare of our country is the great object to which our cares and efforts ought be directed, and I shall derive great satisfaction from a cooperation with you in the pleasing though arduous task of insuring to our fellow citizens the blessings which they have a right to expect from free, efficient and equal government." Put simply, Washington urged Congress to work with him on difficult topics because that's what we all deserve as Americans. It was good advice 228 years ago. It still is.